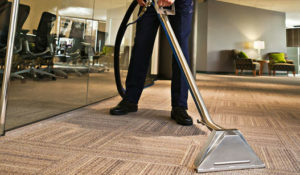 Home › Carpet Cleaning › Spruce up your Business with Commercial Carpet Cleaning! We have provided commercial carpet cleaning for Omaha businesses for the last 33 years. Big Red’s Guaranteed Clean is the only company in Omaha that provides 5 different methods of carpet cleaning to find what fits your needs and your budget. There’s a big word that comes to minds when looking to get your building’s carpet cleaned: budget. You shouldn’t have to put off cleaning your carpet because of cost. Big Red’s wants you to know that we will work with your budget and find a solution that works for you. There are a few ways we go about making sure our carpet cleaning is cost effective for your company. Having multiple methods for commercial carpet cleaning also allows for different pricing levels. Whether we are shampooing, bonnet cleaning, foam cleaning, dry cleaning, or steam cleaning, one is bound to be the right for your business. Regardless of the carpet cleaning method we utilize, we employ several unique procedures that guarantee each client will love our service! We also offer our commercial carpet cleaning 24/7 to accommodate business needs. We want to make sure we don’t get in the way of your business and are more than happy to come after hours. Want your business to shine? Contact Big Red’s Guaranteed Carpet Cleaning or call 402-390-9526 for a fast quote today.